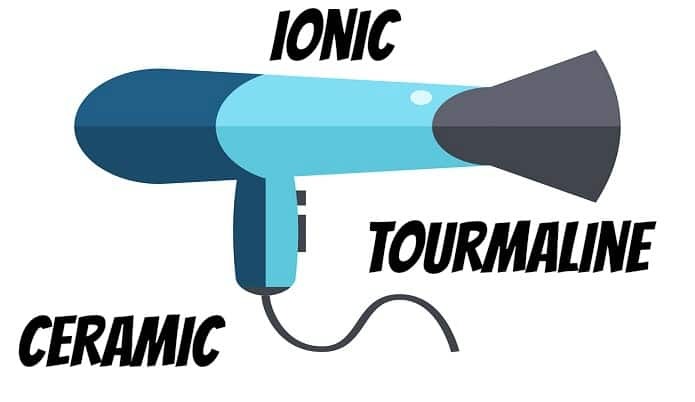 Trying to find out which hair dryer type is best for your hair can be tricky which is why I’m going to go over tourmaline vs ceramic vs ionic types of hair dryers and which is best for your type of hair. Now there can be nothing more frustrating than shopping around for a hair dryer to see all of these different types with their technology’s listed but not really explain what these actually do for your hair. To credit a lot of the brands do list somewhere on the box or buyer info what these different types are made for but you see a lot with something like “Comes with ceramic & Ionic technology” which your average person who really doesn’t know much about blow dryers would have zero clue which one to get. This is why I’m writing this article to help out any people out their trying to understand the differences between them. The main benefits you will see from using a ionic blow dryer is less frizz to your hair. So if you’re someone that tends to have an issue with frizz you should look into this dryer type. The main benefits you will see from using a ceramic blow dryer is less damaged hair. So if you’re someone who has very fragile hair that damages easy then look into this dryer type. The main benefits you will see from using a tourmaline blow dryer is faster drying time but with reduced hair damage. Example a fast drying hair dryer with no technology to it would most likely result in more damaged hair rather than when using a hair dryer with the same fast drying speed but has tourmaline technology added to it. So it would result in the same hair drying speed but with less damaged hair overall. I’m gonna lay this out as simple as possible because it can get a little confusing between different types of ions each type uses. Ceramic hair dryers focus on evenly distributed heat that aim to leave in moisture and reduce hair damage so that you don’t have just dry hair but a very smooth feeling dry. Tourmaline hair dryers main perks are usually faster drying time while reducing hair damage. Ionic hair dryers focus on helping water evaporating quicker which comes with less drying time and less damage to the hair. As you can tell all of these different technologies have one thing in common which is they all try to focus on reducing hair damage but they each do it in their own different way. Now drying to decide between which technology is best for you can be difficult because more than one of the technologies may be very tempting. The great thing about this is hair dryers don’t have to focus on one type of technology you can find blow dryers that have 2 of these technologies in one dryer or some with all 3. However with this comes more price but you get a much better dryer that covers multiple issues/needs that your hair may have. With so many different style hair tools out there right now, I know it’s tough to make the right pick. I have long, wavy, layered, color treated hair. It’s average in thickness (it used to be super thick, but seems to be thinning as I get older). After washing, I use some curl enhancing mousse, flip my head over, scrunch with my fingers and blow dry. I find that I get volume and nice waves this way, but I also get frizz. I purchased a hair dryer, infused with ionic technology, after going through your review. Thanks to your amazing post, as the ionic technology helps to lock in the moisture.